I always have a hard time shopping for men. So this weekend, when we had a 30th birthday party for a friend to attend, I was dumbfounded. With work, the kids, and a persistant sinus cold shopping wasn't really in the cards. This meant finding a homemade gift that wasn't super lame-o. 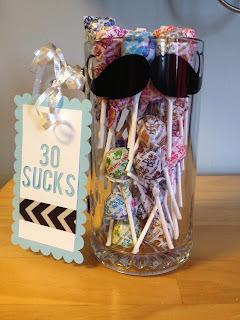 Thanks to my Silhouette Cameo, some extra beer stein's I had in my craft closet, and an overabundance of lollipops thanks to my potty training toddler, I was able to whip this up in no time.